Presidential Elections 2013, Pathetic But Very Islamic. A chosen candidate to vote for. These elections are grotesque and the credibility of Velayat-e Faqih is at stake. If a large number of voters turn out, the reign of the Islamic Republic will be approved. If voters keep away from polling stations, the dictatorship of Velayat-e Faqih will lose its basis and authority. Stay at home on Election Day. Keep away from the Internet. Creating a ghost town is the key. No candidate is worth the trust of your vote. Stay at home and share your thoughts with friends. Dream of a prosperous Iran, a happy Iran. Imagine how we can all get there. There is no limit to your imagination and to your inspiration. Break the cage of religious superstition and phony traditions. 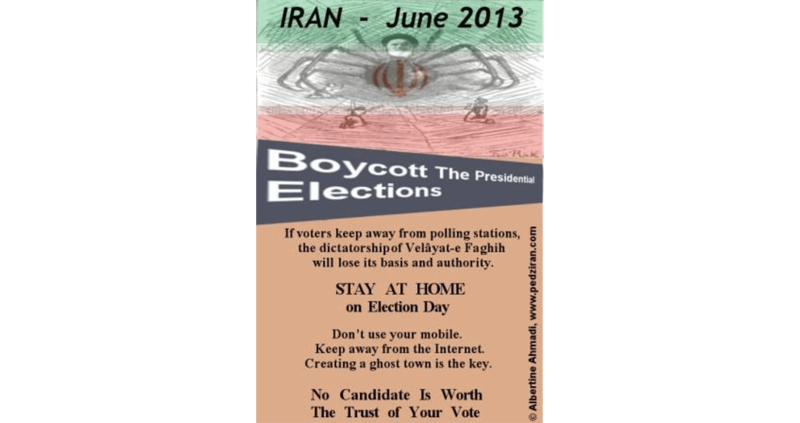 Till now, presidential elections have been rigged and blessed by the Supreme Dictators, R. Khomeiny and A. Khamenei. Their henchmen, Bassidjis and Hezbollahis, killed and repressed protesters, culminating in July 2009. Since then, a file has been opened for every discontented citizen, as the Stasi did in East Germany. 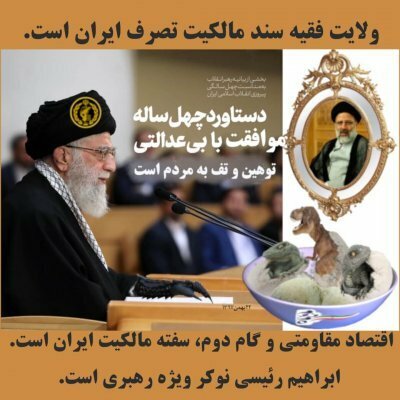 Ayatollahs repeatedly warn critics and browbeat them. An “Islamic Intranet” is implemented for a complete control of the users. The PCs of protesters abroad are regularly under attack from Trojan horses. An unparalleled era of disinformation and propaganda is underway, beginning last autumn with a full-scale crackdown on journalists. The Election of Hassan Rouhani: Rigged? On May 12th, four weeks before D-Day, after shameful and pathetic episodes of bickering, the registration of potential candidates (686!) was closed. Two weeks before D-Day, on May 21st, a shortlist of candidates was published. Only those blessed by the Supreme Dictators are presented (eight men). If you go to the polling stations and crowd the streets on June 14th, you will consent to the reign of Velayat-e Faqih and bow to despots once more. In years to come, the mercenaries of the Islamic Republic will bully you and treat you like a doormat. Grab your chance to show the ayatollahs that Hope is Life. Stay at home. Give hope to your children, to your family and to your friends.